English: The Golden Fleece by Herbert James Draper, 1864-1920. 1904. Oil on canvas, 155 x 272.5 cm. Courtesy of Bradford Museums, Galleries & Heritage (Cartwright Hall). According to Simon Toll, "the image of the powerful femme fatale makes her most dramatic appearance in Draper's ambitious, large canvas The Golden Fleece" (119), which is "certainly the most histrionic" (120) of his paintings. 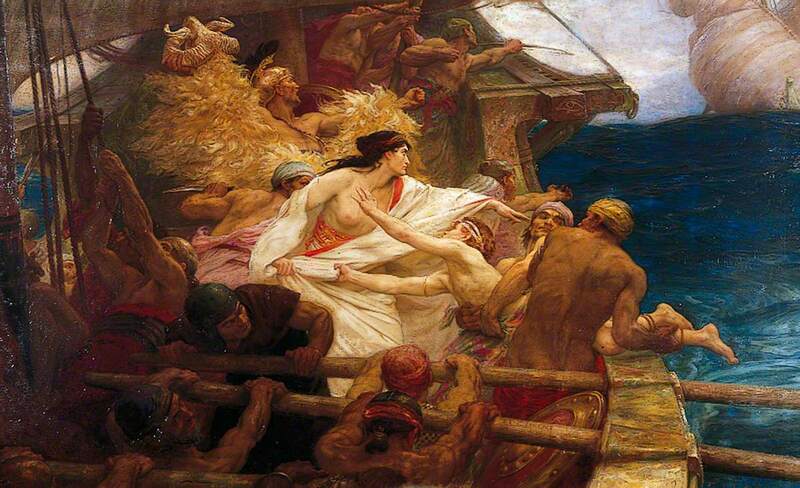 As a passage attached to the painting when it was exhibited at the Royal Academy explains, Medea throws her brother into the sea to drown so that her father will slacken his pursuit longer enough for her to escape with the golden fleece. 收集 Courtesy of Bradford Museums, Galleries & Heritage (Cartwright Hall). 2010年7月2日 (五) 11:37 700 × 419（187 KB） Fanfwah Really clearer version. 2010年7月2日 (五) 11:35 700 × 419（187 KB） Fanfwah clearer version.